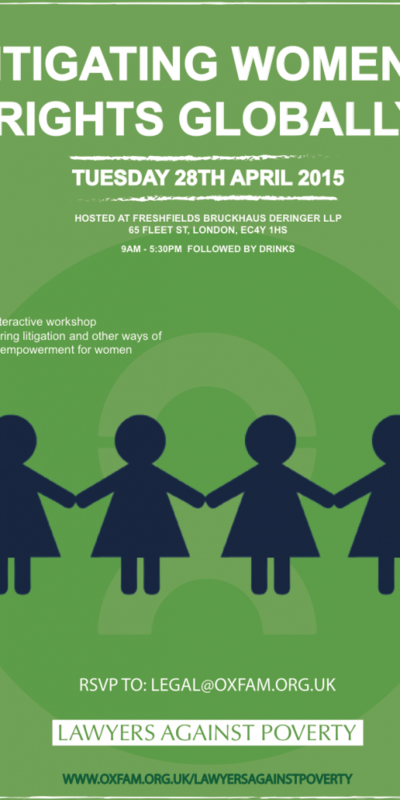 On 28th April, Lawyers Against Poverty are holding a one day conference on Litigating Women’s Rights Globally, at Freshfields Bruckhaus Deringer, 65 Fleet Street, London. The conference will focus on the African Women’s Protocol which guarantees comprehensive legal rights for women and girls. This Protocol to the African Charter on Human and Peoples’ Rights on the Rights of Women in Africa guarantees comprehensive legal rights for women and girls, including but not limited to the right to reproductive rights, and the legal prohibition of female genital mutilation. The protocol also specifies a minimum legal age of marriage and promotes women’s access to and control over productive resources, including land. Gillian Higgins, barrister at 9 Bedford Row International will attend the conference in her capacity as the director of the ARC project concerning the African Court on Human and People’s Rights in Arusha, Tanzania.